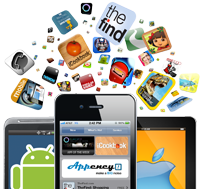 Appency is proud to work with some of the best app developers in almost every app store. We’ve helped bring our clients into the top of their categories, and we’re proud to partner with a quality service like Mag+. Now that your publication is a beautiful-looking app, let us use our extensive experience to give you a hand up on your competitors. Below you’ll find three options that we’ve found help an app launch best. Choose the services you’d like us to help you with, and we’ll be happy to work with you. The app stores doesn’t share their search algorithms, so even veteran developers can have trouble making their app easy to find and appealing to download. Appency lives in the App Store and can help give you the edge you need. We’ll polish your screenshots, app descriptions, and keywords, and give you justification for our changes, or create all-new assets for you, each tailored to your app and the specific requirements of each app store. These will not only help your app get discovered, but convert views to downloads when they get there. Don’t let the app you’ve worked so hard on be bogged down by bland descriptions and screenshots. Make sure people can find your app and then want to download it! You’ve perfected your app and it’s ready to be downloaded by the masses. But first, you’ve got to get your app in front of the press! The first step is a quality press release. We’ll talk to you to determine your exact needs, create a custom press release to promote your app (no plug-in, generic releases here! ), then we’ll send your press release to dozens of online app reviewers and both national and local journalists using PRWeb, the number one online newswire in the world. This service includes a managed submission of one Advanced level press release from PRWeb – a $300 value! There is no better way to show off your app than a high-quality video demonstrating its best features. It’s a better showroom than simple screenshots and so much more engaging than an app description. With this package, you can choose from three different video styles, pick a voice over artist, and we’ll put together a minute-long video shining the spotlight on various features within your app. You’ll get a 1080p copy of your video, and we’ll even publish it on the Mag+ YouTube channel. Each of these marketing solutions can be rushed if you need it sooner. For a 15 percent expedite fee, we’ll give you the finished product three days early (workload permitting). Send us an email here or to contactus@appency.com and we’ll get back to you quickly. Please include the information below. You can reach us a and we’ll email you back as soon as possible!